We, at Rising Stars (The Daily Star) have decided to start a new section called FOTOfeature. Every week, we will publish a single photograph with a 100-word (max) story/description. The description can include anything such as an interesting poem, story, conceptual something – as long as it’s original (i.e. not song lyrics, single lines saying where it was shot or someone else’s poems). Quotations maybe used as part of the description. The photo must also include a caption. The procedures are very selective. There is no payment involved. The photographer gets print publicity and it’s kinda cool. Photos must be in JPG format, at least 2200 pixels wide or tall and under 10MB each. NO frames, watermarks, copyright messages etc. please. For reference and record, I will be posting the published photos under this thread with the accurate published dates. Illegal usage of any content from here will result in severe actions against the accused individual(s). We will sue you, and I’m not kidding! 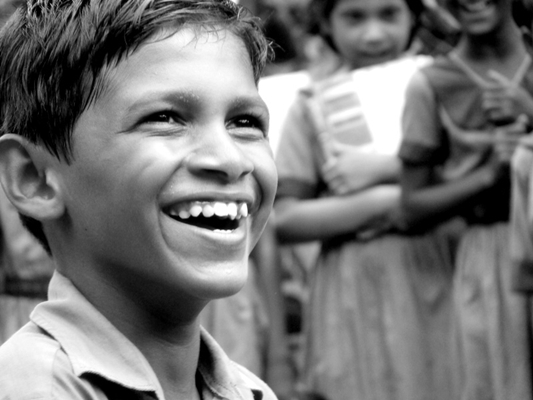 Our community-service based group makes frequent visits to slum schools and this shot was taken at one of those. The school is called “Aalok Shishu Shikkhaloy” – one of our closest affiliations. I’ve personally visited them on several occasions and I absolutely adore the kids. They’re extremely talented, brimming with massive potential. Each visit brings me closer to their lives and their smiles. It’s amazing how they’ve kept their spirits alive, given all the hardships they have to go through. Every time I’m in their area, they would spot me from a distance and come running, shouting and jumping to “Diya Apu! Diya Apu!” They’d follow me (and my friends) around, put up mini performances – their energy is contagious! I sometimes end up feeling like the Pied Piper of Agargaon (where the school is located) as they would follow me to my car in a straight line, loudly singing songs. No matter how hard I try to ditch them because it becomes unsafe for so many children to cross roads together – they somehow find me and wouldn’t let go. It’s an experience of a lifetime. And I’m so grateful to these children for letting me feel it. I’m a drifter. Walking down the rugged streets at the Dhaka University campus with my camera, I reached the dusty roads of Shahbaag. Suddenly I heard it. Like the harps of Thelchtereia, Aglaope, Peisinoe and the three Sirens. It possessed me. But I’m not Odysseus. Drawn by that enchanted music I crossed the road. There I saw him. 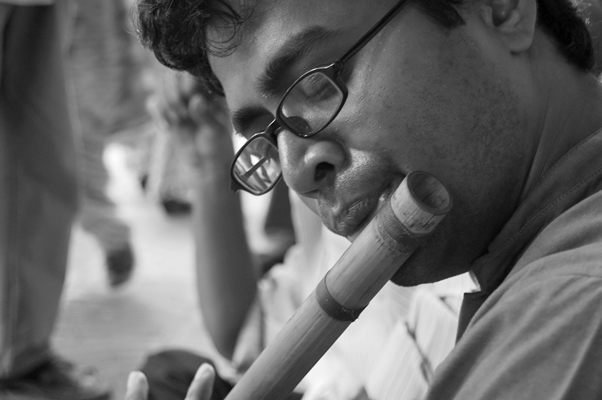 In front of “Charukola” he was playing a flute. I was drunk by his perfect rhythm and he kept playing. I wanted to capture this moment and I did. I was captivated by the music under the soaking sun, the blues above and the magic down below. But alas, I forgot to ask for his name. For me he will always be “The Soul of Sound”. People say painters stroke life through brushes. Red for anger, blue for sorrow, white for tranquility, yellow for mellow and so on. The colours of emotions mark the events of life. Most of us, however, aren’t born Vinci. We’re simple people with complex problems that we consider the bane of our existence. However we battle through the complexities and stroke our own colours. 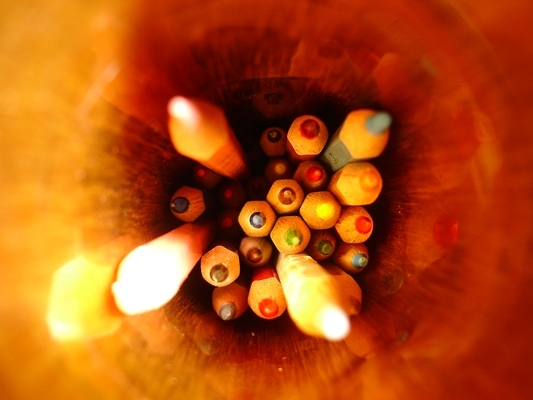 Crayons, paint brushes or simply an old colour pencil lying at an isolated corner of our drawers. We pick one and secretly scratch through our imaginations. Like a mesmerized child filling in blank spaces on a kindergarten colouring book, we carefully fill in voids of our being with flashes of colours. We only pretend to be different from that child at play, but we all love fantasizing the brightest hues in our dreams just the way she does. Monsoon happens to be one of the most awaited seasons of the year. 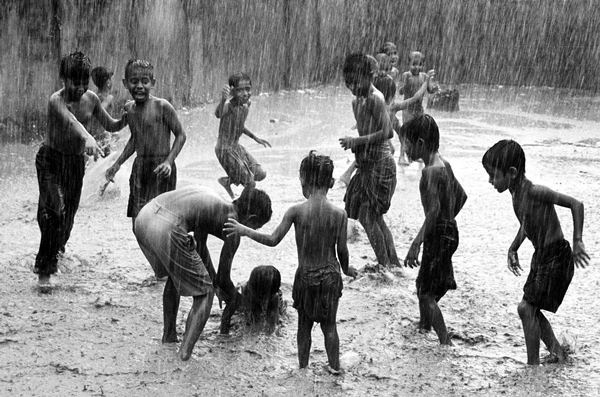 This is a photo of children playing in monsoon in Chittagong. Chittagong is one of the most vulnerable regions in the country, where heavy rainfall cause flooding and landslides. This takes away many lives and leave millions homeless. The radical changes in climate has affected the frequency and severity of the storms. To stabilize the weather patterns for future generations, measures must be taken now to reduce pollution. Increased awareness on consumption and saving should be undertaken and people from all walks of life have a role to play in this. Saving the environment, and in turn, saving the economy is as much a national concern, as it is a personal responsibility. Meet the Moonwalker. Standing on the edge of that mangy old marine vessel,he prepared himself for the peril ahead. Infront of him stretched the murky, polluted riverline of “Buriganga”. Perhaps the only body of water able to display your evil doppelganger instead of your reflection on its ‘coarse’ (yeah, thats right) surface…..and then? Then he dove, what else? Chromium pollutants ain’t man enough to put a stop on youth euphoria, is it now? Nice Composition specially third one..
Pic no Wk 4. I feel something. Is it my upbringing time ?